To set up Outlook 2016 or Outlook for Office 365 as a personal information manager without an email account, use the following steps. Note: These steps will only work for Outlook 2016 or Outlook with an Office 365 subscription. Click the Windows key and then type Run. 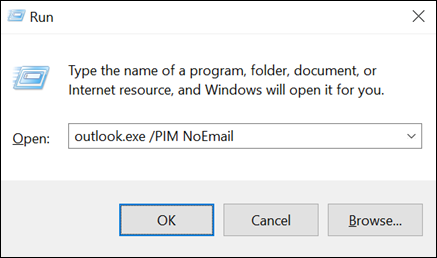 In the Run window, type Outlook.exe /PIM <your profile name> and then click OK. This will create a new profile in Outlook without an email account. You can then use Outlook to store your contacts, tasks, and calendar information. Note: If you create an Outlook profile without an email address, any contacts, tasks, or calendar entries you create will only be accessible on the computer where you created the profile. If you use Outlook on another computer or device, none of your information will synchronize unless you also add an email account to Outlook that supports the sharing of contacts, tasks, and calendar entries.